Scores of 136 and 60 further reinforce the struggles Australia seem to have firstly away from home, but especially on pitches not conducive to batting and in conditions where the ball is swinging around. I often wonder why Chris Rogers is the only batsman in the Australian top six who can handle these challenges and also bat with resistance, patience and common sense – let’s call it Test match batting. Rogers was initially drafted in as a 35-year-old with experience and runs in the English county scene ahead of the 2013 Ashes series. He topped the run-scoring for Australia across the back-to-back series in 2013-14. His inclusion was logical, appropriate and ideal for the situation. How useful would someone in a similar mould have been, such as the experienced West Australian batsman Michael Klinger? At the same age now as Rogers in 2013, would Klinger’s inclusion have been the best way to go? 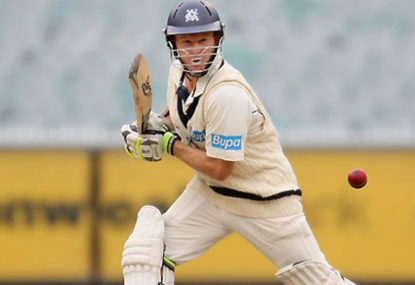 Since his first-class debut for Victoria in the 1998-99 summer, Klinger has amassed over 9000 runs at an average of just over 38. Very respectable numbers over an enduring career. For so long Klinger has been ignored by the selectors and you could argue he was unfortunately born in the wrong era – with top-order national batsmen such as Matthew Hayden and Justin Langer, it was always going to be difficult to break into the side. What Klinger also has that would be advantageous right now is experience in English conditions. He has continued to score runs at county level – this season alone we have seen him in prolific run-scoring touch for Gloucestershire. Klinger is a stylish player with an effective and correct technique. His ability to bat with perseverance and grit is exactly what it takes to score runs in England, and his grafting style would complement the more cavalier and whirlwind approach of some of the Australian batsmen who contributed to the side’s downfall with the bat. Batting is the stem of Australia’s problems, and the series may have slipped away because of it. Australia hasn’t been able to win in England since 2001, so this inability to handle English pitches and bowling in their own backyard is not a new problem. Klinger will likely go down as an unlucky cricketer who never got his opportunity at the top level. It would be a shame, and I’m sure he is wondering what more he needs to do, as a batsman like him would be ideal right now.